Make ahead: The dough needs to be refrigerated for about 1 hour. The cookies can be stored at room temperature in an airtight container for about three days or frozen for up to three months. 1. Sift together the flour, cream of tartar, baking soda, 1 teaspoon of the cardamom and the salt in a large bowl. 2. Combine the butter and brown sugar in the bowl of a stand mixer or handheld electric mixer. Beat on medium speed for 1 minute. Increase the speed to high and beat until very light and fluffy, two or three minutes, stopping a couple of times to scrape down the sides of the bowl as needed. Reduce the speed to medium and beat in the eggs, one at a time, and the vanilla extract. Stop to scrape down the sides of the bowl. 3. Add about one-third of the dry ingredients; beat on low speed until fully incorporated. Repeat two more times, stopping to scrape down the sides of the bowl as needed, until the dry ingredients are incorporated. 4. Cover and refrigerate for about an hour, until firm. 5. Preheat the oven to 350 degrees, positioning the racks in the upper and lower thirds of the oven. Line several baking sheets with parchment paper or silicone liners. 6. Stir together the granulated sugar and remaining 1 teaspoon of cardamom in a medium bowl. Use a #100 disher (a ¾-tablespoon scoop) or a tablespoon to scoop small balls of dough, a few at a time, into the sugar-cardamom mixture, then roll the pieces to coat them and lightly roll them into balls between your palms, pressing the sugar mixture into the dough. Arrange the cookies two inches apart on each baking sheet. 7. Bake two sheets at a time for five minutes, then rotate the baking sheets top to bottom and front to back. Bake for four to six minutes, until the tops of the cookies are crackled and the edges are just barely browned. Transfer to a wire rack to cool before serving or storing. Use a strainer to sift any extra cardamom-sugar mixture onto the cookies (this will keep separate any clumps of dough that might be left in the sugar). 8. Repeat to use all of the dough. From Food editor Joe Yonan, from his “Serve Yourself: Nightly Adventures in Cooking for One” (Ten Speed Press, 2011). This is a simple and consistently delicious shortbread recipe. 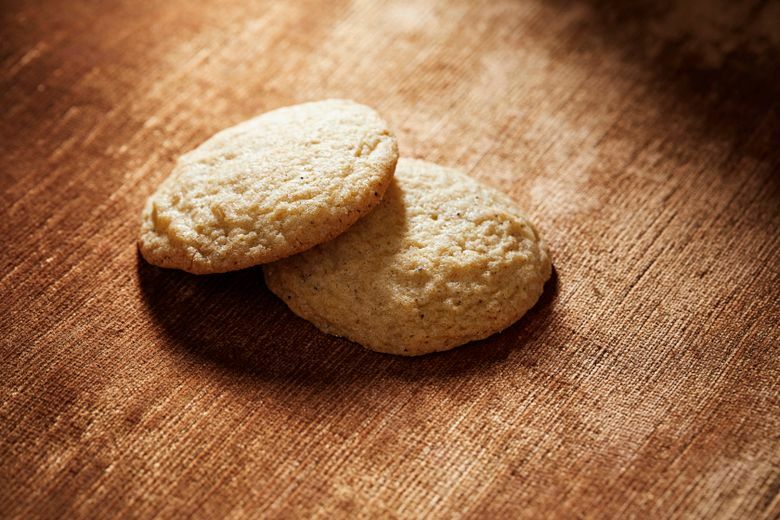 Make ahead: The shortbread can be stored in an airtight container for up to five days. 1. Position an oven rack in the middle of the oven; preheat to 325 degrees. Have an ungreased 9-by-13-inch baking pan at hand. 2. Combine the butter and both sugars in the bowl of a stand mixer or handheld electric mixer; beat on medium speed for about one minute, just until blended. Scrape down the sides of the bowl, then add the vanilla extract and salt. Add the flour in two additions, beating just until incorporated. 3. Use your fingers or a sturdy rubber spatula to press the dough evenly over the bottom of the pan. Bake for about 40 minutes or until the shortbread is golden brown; start checking at 35 minutes. it will look darker than regular shortbread. The edges will be slightly darker; do not underbake. Transfer the pan to a wire rack; let cool in the pan for five to 10 minutes. 4. 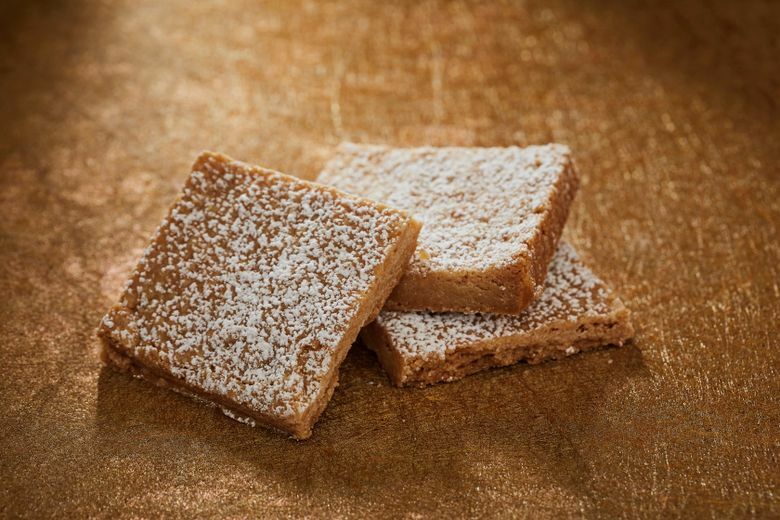 Use a sharp, thin-bladed knife to cut the shortbread, still in the pan, into 36 rectangles. Let cool completely in the pan before serving or storing. Start to finish, these potent treats can take as little as eight minutes to make, and they taste even better in a day or two. 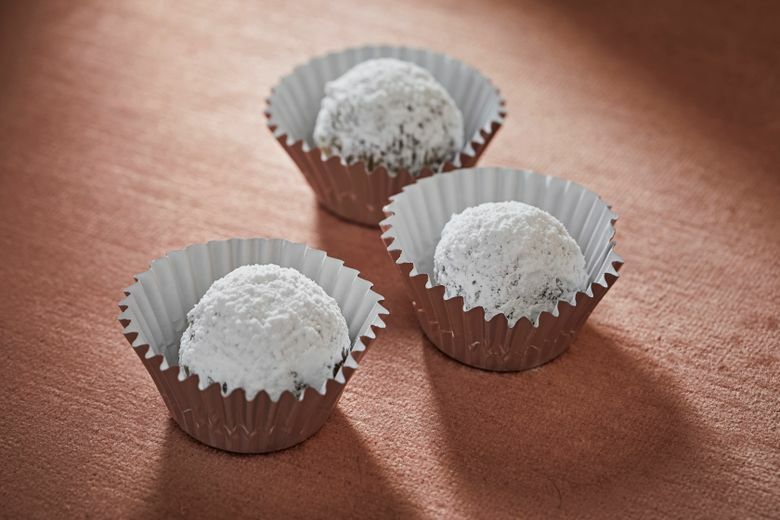 Make ahead: The rum balls can be stored in an airtight container at room temperature for up to five days; they may need a renewed dusting of confectioners’ sugar. 1. Combine the vanilla wafer crumbs, rum, honey and walnuts in a medium bowl, until thoroughly blended. 2. Shape into balls about ¾-inch wide. Dust completely with a light coating of confectioners’ sugar. (If you plan to freeze them, do not dust until they are defrosted.) Place in individual candy-size paper cups. Adapted from a 1970s Bacardi rum recipe booklet. The combination of sweet toasted nuts, butter and sugar is a winner; this variation adds smoky bits of bacon! If you decide to use bacon, be sure to use a good-quality brand, such as Nueske’s or Benton’s. This is an egg-free dough that doesn’t need chilling time. 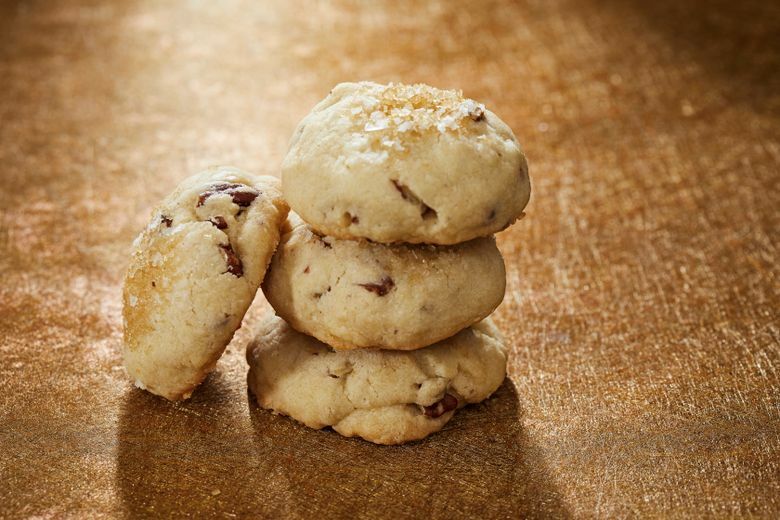 Make ahead: The cookies can be stored in an airtight container for up to five days, or frozen for up to one month. Where to buy: Demerara sugar is a raw, coarse-crystal brown sugar that delivers nice exterior crunch and color. It is carried in most supermarkets. 1. Preheat the oven 325 degrees. Line a few baking sheets with parchment paper or silicone liners. 2. Spread the pecans on one of the sheets; toast in the oven (middle rack) for 10 to 12 minutes, checking on them after eight minutes. 3. They should be fragrant and lightly browned. Cool completely, then coarsely chop to pea-size. 4. Combine the butter and granulated sugar in the bowl of a stand mixer or use a handheld electric mixer; beat on medium speed for about three minutes, until creamy and lightened. Stop to scrape down the bowl. 5. Add the water and vanilla extract, beating (low speed) to incorporate, then add the flour and chopped pecans. Beat until evenly incorporated. 6. Scoop the dough into 1-ounce portions (or use 2 tablespoons’ worth) to roll into 24 equal balls. Arrange them on the baking sheets, pressing each ball slightly with the palm of your hand. Space the balls at least 1½ inches apart. 7. Sprinkle each portion with a little of the salt and a liberal amount of Demerara sugar. Bake one sheet at a time (middle rack) for 16 to 18 minutes, until light brown on top and golden brown on the bottom. Transfer to wire racks to cool completely. Variation: Cook three slices of bacon, starting in a cold skillet over medium heat. Drain on paper towels, then chop into ¼-inch pieces. Add to the dough along with the chopped pecans. Adapted from “Zingerman’s Bakehouse” by Amy Emberling and Frank Carollo (Chronicle, 2017).